A couple weeks ago I spent some time kicking my standard chicken salad recipe into a new gear. 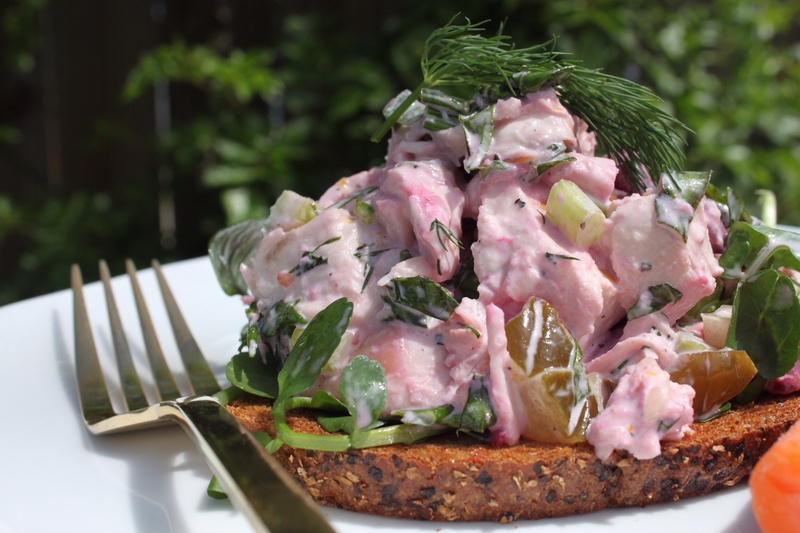 Extra herbs – dill and basil – plus really good sweet pickles and pickled beets for an extra flavor and color. My how it turned out – despite the interesting pink color, this salad full of moist chicken, crunchy celery and scallions had an extra boost from the sweet, herby, spicy and fresh additions. I enjoyed mine in an open faced sandwich over watercress. However, it’s perfect on it’s on it’s own, in a full two-sided sandwich or in a salad with baby greens. I think this recipe is perfect for a Mother’s Day lunch. It’s also perfect for a picnic or a lunchbox. Place the chicken breasts, skin side up, on a sheet pan and rub them with olive oil. Sprinkle generously with salt and pepper. Roast for 35 to 40 minutes, until the chicken is cooked through. Set aside to cool. When the chicken is cool, remove and discard the skin and bones and cut the chicken into 3/4-inch dice. Place the chicken in a bowl and add the mayonnaise, and remainder of ingredients. Mix well and taste for seasoning. At this point, add more components you may want more of!